The Network of Vauban sites and the Paris Mint have joined forces to print a special ten-year anniversary souvenir medal which is likely to please and de-light visitors and collectors alike. In 2018, the major Vauban Fortification sites will collectively celebrate their ten-year inscription on the UNESCO World Heritage List. Accordingly, the Vauban network has taken this opportunity to commemorate the twelve listed sites* with a common image. The following key words and ideas, “celebrate, unite, federate,” symbolize their com-mon identity and pay tribute to Vauban’s life’s work. It’s small, it’s festive, it’s made in France ! Designed with artistic prowess and finesse by the communication agency “Midi à 14h,” and struck by the Paris Mint at its historic site on the Quai Conti in Paris, this finely crafted anniversary medal is a true work of art destined to be kept in a purse or safe-guarded in a jewel box, handled, contemplated and admired. What you will discover when looking at this work of art are twelve Vauban sites on one coin. Only twenty thousand examples of this special edition medal have been struck, and they will be on sale at the tourist offices of all major Vauban sites, in the National Mon-ument Centre shop found at Mount-Dauphin, the Citadel of Besançon, the Vauban Tower at Camaret-sur-Mer and at the maritime museum on Tatihou Island. 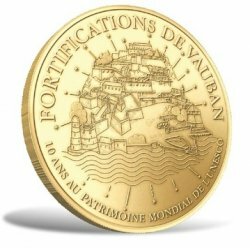 This medal is the first in a series of projects planned in 2018, aimed at celebrating the 10th anniversary of the Inscription of Vauban’s fortifications on the UNESCO World Heritage List. It is also a landmark step in a common policy to highlight the twelve major Vauban sites.